Dame Patience had been heavily pregnant for several months but managed to stay off the media to avoid unnecessary publicity. 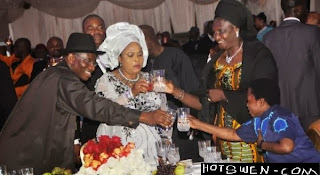 Hot Swen Media however, attended the naming ceremony of the new baby at the presidential villa, Aso Rock, Abuja today, where Mrs Patience named her daughter Peace Jonathan and warned the general public to address her as Mama Peace henceforth. Mama Peace said anyone who refers to her as Patience from now on will be arrested. Once again, congratulations to President Jonathan and Mama Peace.